April 9, 2019 Robert W.
Business sign vinyl lettering can be done by do it yourselfers in Las Vegas. After all, how hard can it be to take off old business vinyl lettering and replace it with brand new lettering for your new business ? It is not difficult to scrape old vinyl lettering off of windows, pylon sign or box sign. A heat gun is your best friend if they come off in pieces as the heat gun will warm up the old vinyl lettering and make it easier to peel off. New business sign vinyl lettering can then be added after the old vinyl has been removed and the surface cleaned. Do it yourselfers can save a lot of money by doing the work themselves instead of having a sign professional travel to the location and install the lettering for you. Business sign vinyl lettering is just plotting letters from a roll of vinyl and then applying transfer tape to the plotted letters so that it can be transferred as one piece. Many people mistakenly think they are going to get the vinyl letters separately and then they have to install each letter. The vinyl lettering comes and installs in one piece and all the do it yourselfer needs to do is clean off the old lettering and then measure the sign so that the new lettering is centered on the sign opening. ( I will throw in this disclaimer that if the sign requires a ladder to get to, heights can be difficult and maybe a professional should be brought in so as to avoid any type of danger from falling) Sign professionals are used to heights and with the wind, they can be tricky. So what’s the cost of door vinyl lettering, about $25- $30.00. and vinyl lettering for signs is based upon how big the sign needs to be. Contact a local sign company and inquire about making your own business sign. April 7, 2019 Robert W.
Window lettering signs are one of the first signs a company will design and install as a way to identify themselves. Window lettering signs are usually vinyl lettering that is posted on a door or window with the businesses name and contact information and is very inexpensive. Most all businesses will have their front door vinyl lettered or window vinyl lettered. Window lettering signs are cheap and can be installed yourself. Most stores or businesses will want there name, telephone number, website and hours of operation on the window glass. These 4 or 5 lines in white vinyl lettering costs only about $25 to $35.00 and are easy to install. The trick on the installation is to take good measurements and center the vinyl sign on the door so it is even on both sides from the top and the distance to both sides are the same. The sign shop will give you the lettering on transfer tape, so the vinyl lettering sign installs as one piece. Another popular sign for business windows is the see through graphics called window perforation. The window perforation sign allows for a print on the material that is then attached to the glass so everybody on the outside can only see what is printed and the people on the inside can look out the window with an unobstructed view. The window perforation see through sign also acts as a heat shield / tint and limits the amount of sun that can come through the window. Many people like this type of sign because it allows them to see everybody that approaches the door before it opens. Window lettering signs are cheap and easy to install. Just go down to your local sign store and have them plot out / cut out your vinyl lettering and install it yourself and save yourself money. Window Vinyl lettering For Cheap Advertisment. April 5, 2019 Robert W.
Window vinyl lettering is a cheap, effective and easy way to advertise your company or just about anything on your window. Many companies take advantage of their company vehicles glass as a way to advertise their company along with their contact information in order to get better known. Window vinyl lettering is usually white or yellow as these two colors stand out better against glass. Darker colors seem to blend in well to glass in shade and sunlight. Vinyl lettering on vehicle windows can be small as to not impair the drivers view, but yet large enough so that they can be seen from a distance. Many companies take advantage of this cheap advertising by placing their business name and telephone number on their company vehicles. Window vinyl lettering also works great for office, store and business windows. In fact, one of the first signs most businesses do is the vinyl lettering of their company name, hours of operation and contact information on there front door. This vinyl lettering is usually in white or yellow vinyl as it is the easiest to see. From there, businesses and stores will vinyl letter other windows with more information about their products and services so that people passing by will take notice of their business. This is cheap advertisement, since once the vinyl lettering has been placed on the windows, it will last a very long time. Installation can actually be done by yourself or an employee, as it is not very difficult. The key to a great installation is just making sure that the vinyl lettering is even in the window from top to bottom and side to side. 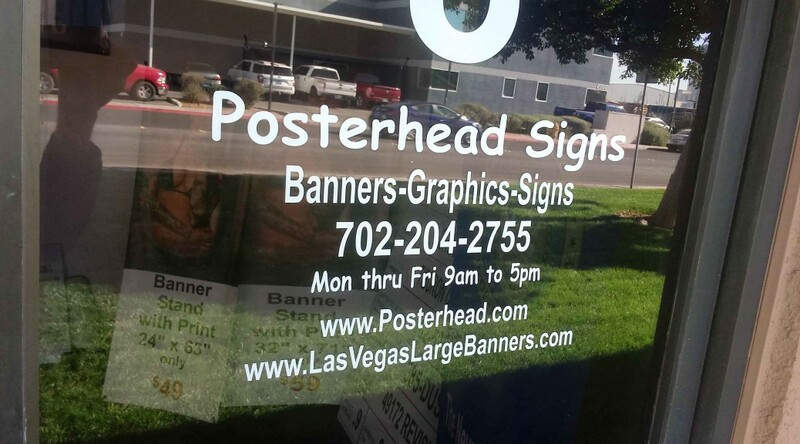 Window vinyl lettering can be designed and made at local Southern Nevada sign stores at cheap prices and fast, often the same day.